My pumpkin will have the traditional smiley mouth and triangle eyes this year - just like every other year. But those of you who want to get creative can head over to ThinkGeek, and check out their yearly geeky pumpkin template contest. 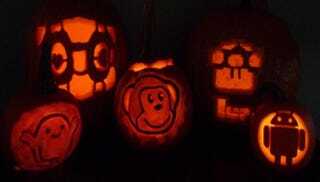 There's a Pac O' Lantern, a Death Star, and Iron Man's glowing chest thing (help me out, here, Marvel folks). Should you be inspired to create a template of your own, there's one more day to go before the deadline passes.